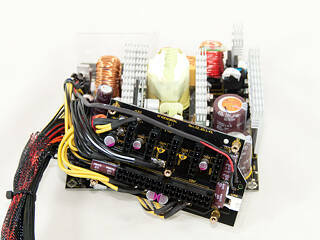 The PSU is made by Seasonic. While the secondary side uses DC-DC converters for the generation of the minor rails, the +12V rail is rectified by passive components (Schottky Barrier Diodes) instead of active ones (mosfets) to reduce costs, but the same applies to efficiency. The overall design is definitely not cutting edge, but the quality of construction is very high, and the used components are very good, and expensive. The first part of the transient filter is located on a small PCB behind the AC receptacle that is protected against EMI by a metallic shield. On this PCB are two Y caps, a single X, and a CM choke. The second part of the transient filtering stage is on the main PCB and consists of two CM chokes, one X cap, a pair of Y caps after the bridge rectifiers, and an MOV. 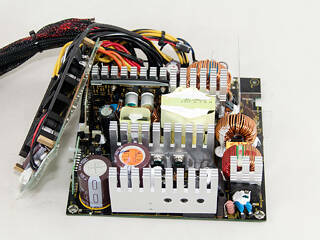 The parallel bridge rectifiers, two GBU806, are bolted onto a dedicated heatsink. Each one can rectify up to 8 A of current, which allows them to handle up to 16 A combined, which easily covers the requirements of this PSU. Three Fairchild FDP18N50 fets in the APFC chop the fully rectified signal into constant pulse sequences, and a diode (STTH8S06D) helps in boosting the pulsating rectified mains up to a loosely regulated ~380V DC bus voltage. The two parallel hold-up caps are provided by Chemi-Con (400 V, 105°C, KMR series); the big one has a capacity of 330 μF and the other has a capacity of 220 μF. They are at 550 μF combined, a relative low capacity for a 750 W PSU, but the hold-up test results will clearly show this. Two Infineon SPP20N60C3 fets are used as main switchers, and the combo PFC/PWM controller is a Champion CM6802. It is an upgraded version of the famous CM6800, an IC that is widely used in Bronze efficiency units. 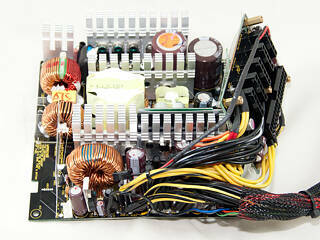 The boost diode of the APFC is bolted to the same heatsink as that of the main switchers. The standby PWM controller is an Infineon ICE2QR4765 IC, and the 5VSB circuit is filtered by a single Rubycon cap. The diode that rectifies this rail, an SBR10U45, is located on the solder side of the main PCB. DC-DC converters generate the minor rails in the secondary side; and the +12Vs are rectified by five SBR30A50CT diodes. Schottky diodes may have lower voltage drops than standard diodes; less energy is therefore lost on them, but they are still less efficient than mosfets. That said, the latter are more expensive, so manufacturers avoid using them in lower-efficiency PSUs to shave a couple bucks off the production cost. All filtering caps in the secondary side are provided by Chemi-Con and are rated at up to 105°C. The protections IC is a SITI PS223. It is installed on a vertical daughter-board and supports OCP for up to two +12V rails, covering the units specifications. It is also one of the very few ICs to support OTP (Over Temperature Protection) out of the box. 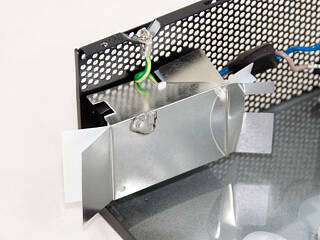 The rear side of the modular PCB is protected by a plastic shield. The front has several Enesol polymer caps along with three electrolytic Chemi-Cons that provide some extra ripple filtering. The +12V rails' numbering on the modular PCB shows that this was initially a four +12V rail platform, but three rails have in this case been shorted into one, so their final total is, as Antec states, two. Soldering quality on the main PCB is good overall, although not as clean as Seasonic's high-end implementations, but the latter are significantly more expensive than this platform. 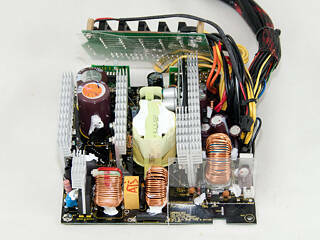 The fan is provided by Seasonic's favorite fan manufacturer, ADDA, and its model number is ADN512UB-A90LD. It is equipped with double ball-bearings and has LEDs. This is a high-speed fan; however, the fan-control circuit keeps its speed as low as possible--depending on the circumstances/conditions--to keep its output noise low.